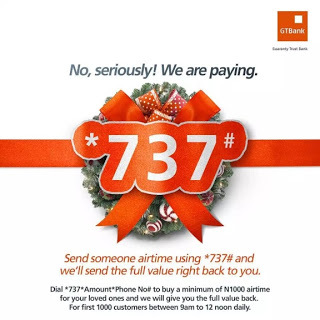 This is another special offer from GTbank to their Instant banking users. Apart from Opera News App Free Airtime and rewards. Guarantee Trust Bank is giving out N10,000 worth of Airtime when you recharge your Sim card using the GTbank USSD code *737#. Remember that the offer is for first 1,000 customers between 9AM and 12noon daily, this means first come first served condition is applied to it.